Hi everyone! 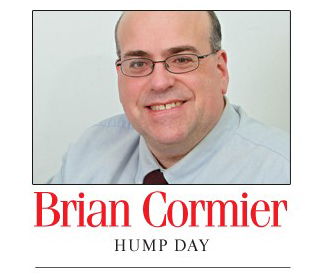 I just wanted to let you know that my Hump Day column has ended its run in the Moncton Times & Transcript after more than 11 years. It has been a GREAT run. I truly appreciated the opportunity of sharing my views and stories with readers over nearly 600 columns! I’m very grateful to the readers and editors at the Times & Transcript. I’ll certainly miss the column and interactions with readers, but it will be nice to get my Monday nights back to myself! Thank you to everyone for your support and for reading the column for all these years! It’s been an honour! I never thought I’d see the day, but my mother and her husband got their first computer last week. Welcome to the wonderful world of the Internet and all its possibilities! I can’t imagine not having access to the Internet. On the odd occasion that the power has gone out or the Internet was down, I felt a combination of freedom combined with incredible dread that I didn’t know right up to that second what my Facebook friends were having for supper. It was quite a dilemma, let me tell you. First world problems, for sure. I seem to remember that I was a bored kid. Sunday afternoons were the absolute worst and most depressing. There was nothing on television (except for interminable reruns of CBC’s Hymn Sing), no stores were open (this was the 1970s and early 1980s) and I was pretty much stuck at home. One of our great joys was a Saturday trip to the Mountain Road branch of United Bookstore (as it was called at the time) to trade in a whole pile of comics for new-to-us ones. That would make that following Sunday quite a joy, actually, since we were all busy reading our new comics. So now my mother will learn how to use a computer from scratch. And yes, I had to show her how to turn it on. Hey, if you’ve never used one, you have to start somewhere, eh? The one thing everyone needs to remember when learning how to use a computer and the Internet: no question is a bad question! It’s better to ask (what you consider to be) a stupid question than to find your computer infected with a virus or that you’ve somehow given your credit card number to a supposed Nigerian prince who wants to marry you and needed money for the airfare to Canada. Mistakes will happen, of course, but that’s no reason not to plow forward into the wonderful world that awaits you online. Just use your common sense. Would you give your credit card number to a stranger who walks up to you on the street? Of course not. Then don’t do it online either. Would you invite a complete and utter stranger with wild eyes and a maniacal laugh who’s carrying a knife into your home who tells you that they want to be your friend? Of course not. Well, don’t become friends with strangers on Facebook either! Being online doesn’t mean leaving your common sense at the door. If your neighbour came up to you tomorrow and told you that aliens with three heads are roaming the streets, would you believe him? No, you’d probably go over to his house and look for a three-foot-high stack of empty whiskey bottles in his back yard. Well, if you read something similar online, use your same judgment. Don’t share it. Don’t believe it. Don’t freak out about it. Ignore it and move on, just like in real life. 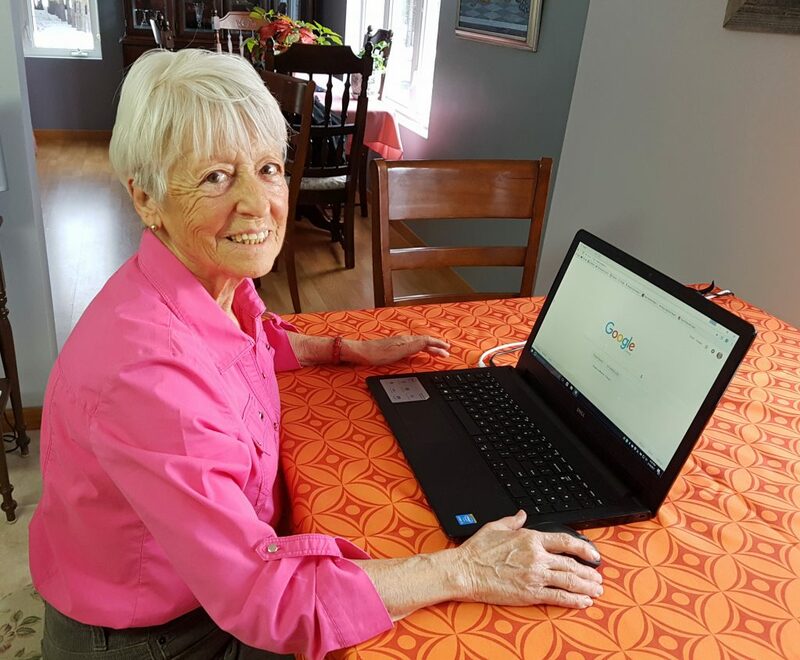 My mother – Freda Cormier – and her new laptop! Getting online has opened up the world to so many seniors who were previously isolated (to varying degrees). If you know how to turn on a computer, open a browser and type a few words, you can now connect to the world. My mother’s heard about Facebook for years and asks me if anyone in the family has posted interesting photos every time I see her. Now, she’ll have the ability to see all that in real time. When she watches the news and weather on television and they say to check Facebook or the website for more information, she’ll be able to do it. What is intimidating now will be second nature in a month from now. And my 11-year-old nephew will be absolutely thrilled! Now that Nanny has the Internet, he won’t have to sit on the neighbour’s steps to borrow their Wi-Fi signal to play his video games when he visits. Boy, will he be surprised when Nanny tells him that she’s online! And hey, if he decides to visit more often (which I’m sure he will), then so be it. Welcome to the Internet, Mom – and I hope that my future Nigerian step-dad is nice (and rich, too). Sorry to break everyone’s optimistic balloon about spring being here, but there are likely a few blizzards to come as Old Man Winter enters his cranky senior years. Sure, he may be writing his will and prepaying his funeral because the warm weather is right around the corner, but he still has some gumption left in him. Before mid-April comes around and the nice temperatures hold, we’re bound to get hit over the head with his cane. With that said, there are definitely signs of spring out there. It’s already March break for New Brunswick students, which is the last long rest anyone will have before the lead-up to the end of the school year in just a few months (already!). And in case you forgot, Daylight Saving Time returns this weekend, so be sure to move your clocks ahead by one hour before you go to bed on Saturday night. Yeah, it’s that time of year when it’s still winter but signs of spring make us hopeful. Even if the air is cold, the sun is growing stronger and the backyard rinks are well past rehabilitating after a bout of warm weather and the strengthening sun. Of course, this also means that neighbourhood playgrounds will soon be filled with kids running around and playing. Some will be accompanied by parents. Some will not. And while I’m certainly not a proponent of helicopter parenting, I keep wondering how these kids running around unsupervised even survive into adolescence. I’m being hypocritical, I admit, because when I was in the playground with neighbourhood friends in the early 1970s, we certainly didn’t have any parents hanging around. We went home when we heard our mothers calling for us from down the street or when our rumbling stomachs told us that it was time to eat. We didn’t get kidnapped – unless we were abducted by aliens for scientific experiments and then returned after our memories were wiped clean. Despite that, we all turned out fine, eh? None of us became serial killers because our parents didn’t have us on leashes. We left the house and eventually we came back home. The odd time there was any worry was if it was getting dark and all the usual friends were already home and there was still no sign of one of us. At some point we’d remember to call home or otherwise get tracked down and scolded. Now that I think about it, it’s not the ‘kidnappers’ out in public that parents should be worried about these days. Neighbourhoods are probably the safest place your kids can hang out. The kids you need to worry about are the ones locked in their bedrooms all day with access to the Internet. Those online trolls (and other bad dudes) are the ones who should send shivers down the spine of every parent. These days, it’s ironic that maybe your kids are safer playing outside – even if they’re where you can’t see them – rather than inside the house secretly chatting up some 40-year-old pervert who’s pretending to be 13. Outside, at least you can see the sketchy van (literally or figuratively) lurking. Can hanging out at home actually be less safe than being outside and playing? Online, it’s all hidden from view with kids holed up in their rooms. Even out in the open, the screens are usually turned away from the prying eyes of parents. For all they know, their kids could be watching a SpongeBob SquarePants cartoon when they’re actually being targeted by a criminal. I realize it may seem counterintuitive to think that way. Can hanging out at home actually be less safe than being outside and playing? If your kids are too young for smartphones, being outside is a great way to take a break from the zombifying effects of the Internet, video games, etc. Otherwise, pray your teens have online street smarts. I always felt very safe around my neighbourhood as a kid. Of course, there were a few bad pockets around here and there, but if you minded your own business, there was usually no trouble. 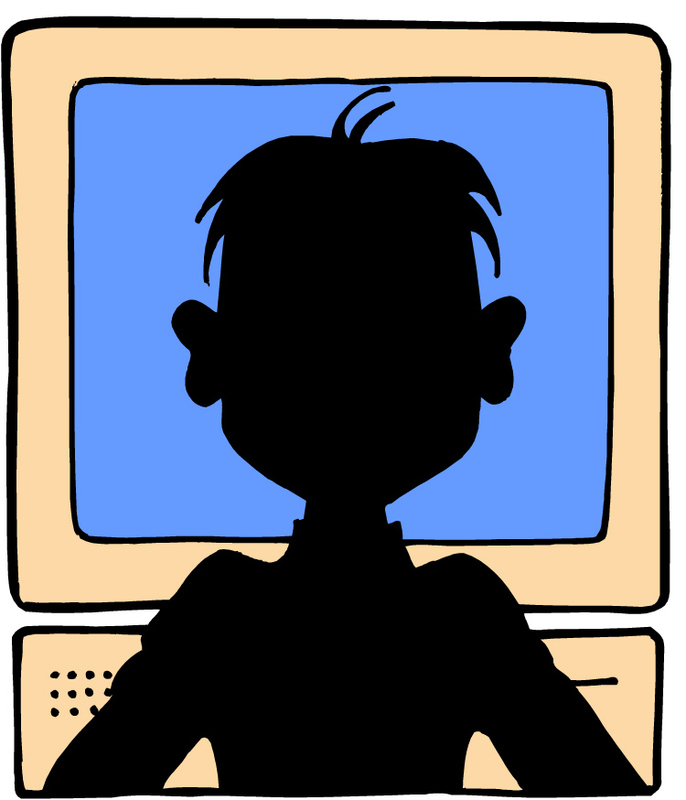 Today, with the Internet, children can be online prey to anyone in the world. Talk to your kids, folks! Parents need to take their heads out of the sand and have difficult chats with their kids – especially teens – about the potential risks of being online. Online activity can be great, all I’m saying is be realistic! Just because your kid is home doesn’t mean they’re safe. And now that I’ve scared the living daylights out of all you parents out there, be sure to send your kids outside to play this spring and take a break from technology. They’ll be healthier – and perhaps safer. For those of us who stayed up until well after 1 a.m. to watch the Oscars on Sunday, at least we saw a bit of history with a colossal mistake that should have never happened when Faye Dunaway announced that La La Land won Best Picture. In fact, it was Moonlight that had won, but someone mixed up the envelopes and she and co-presenter Warren Beatty were left red-faced after they’d inadvertently made the biggest boo-boo in the history of the Academy Awards. Watching it as it happened, I sat up and took notice through bleary eyes. Viewers were stunned. The Academy was stunned. The winners and losers were stunned. Luckily, the producers of La La Land were the epitome of class and handled the blunder like real pros. This just goes to prove, folks, that it ain’t over until it’s over. This was the equivalent of a bony hand popping out of a grave at the end of a horror movie or the supposedly dead hockey-mask-wearing serial killer opening one eye to the sound of a screeching violin, quickly followed by the closing credits. It actually took me a long time to fall asleep after that. I felt horrible for the producers of La La Land. I mean the apparent pinnacle of their careers was snatched away from them due to what was basically human error. A wrong envelope. Hopes and dreams were shattered (and made – if you worked on Moonlight) by the contents of an envelope. Reminds me of when I get my power bills during the winter. I’m having a great day and then I see that familiar envelope in the mailbox. I open it gingerly, take one look at how many numbers there are before the decimal point and then invariably wince. Ouch! I’ll be glad when spring is here and the need for constant heat in the house has passed. On Monday morning, I thought that perhaps a midday nap would be well deserved at some point. 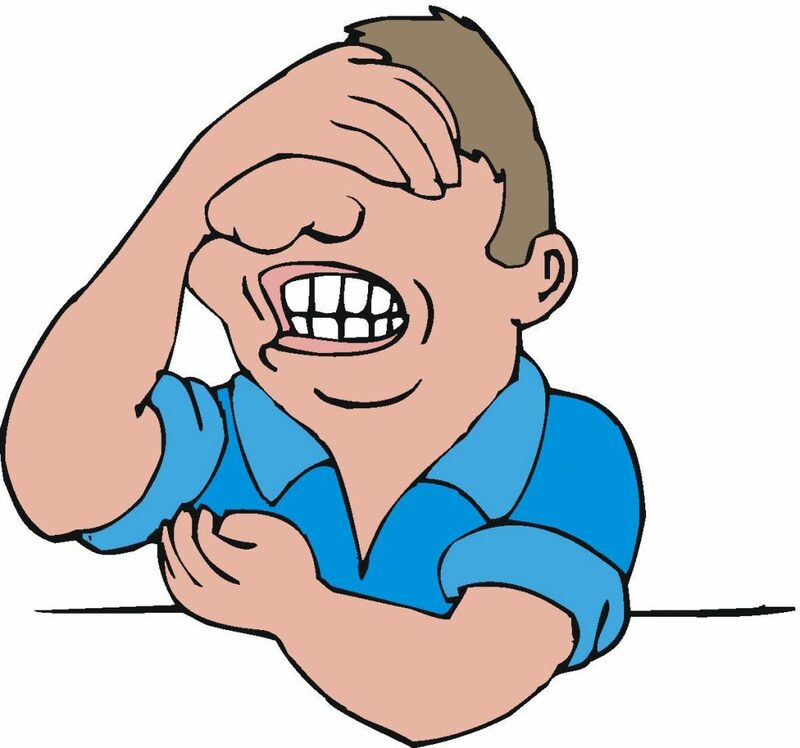 Then I remembered my own major flub from last week. I think my napping days are over until I can handle them like a grown man in a responsible manner. Picture it. Moncton. February 2017. A handsome young man has just come in from picking cotton in the field. His skin is tanned a light shade of cocoa from working outside in the scorching sun. His glistening muscles sparkle as he shakes his long locks of blond hair, sending sweat flying off into the hot, humid air which is heavy with lust. In case you haven’t guessed – that handsome young man is me, which makes about as much sense as what really happened on that day when I made my own mistake. Perhaps it wasn’t as public as the Academy Awards blooper, but I felt awful. What I was trying to do was set up a scenario in that it was justified for me to take a late-afternoon nap and fall asleep for nearly two hours. And I’m not talking a light sleep. I’m talking drool dripping down your chin, mouth wide open, snoring like a freight train. It was glorious. At 6 p.m., the telephone rang. I did what most people do when they answer the telephone out of a dead sleep: I pretended I’d been awake. Unfortunately, I woke up so confused and out of sorts that I made no sense to the caller, who was wondering why I wasn’t at our pre-determined appointment. What? Who is this? What are you talking about? When they told me, I did that ‘wake up from a nightmare’ thing you see all the time on television where someone sits up straight in bed suddenly with their eyes wide open and breathing heavily. Yup, my glorious nap ended badly. 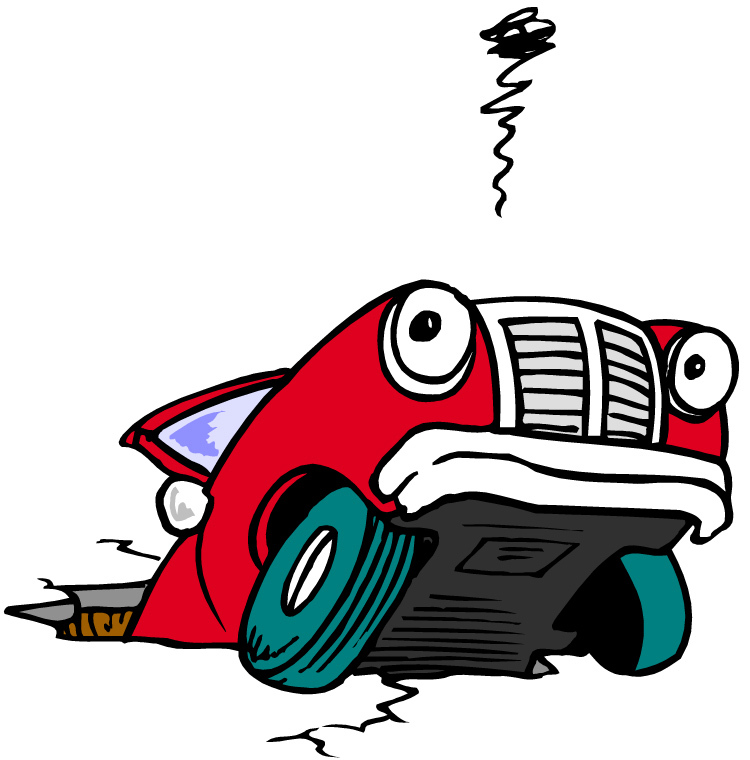 I’d messed up and had completely forgotten an appointment. Worse, it was with two people, not just one. Thankfully, it was for volunteer work and not a client. But still, I can’t believe I did it. Now that I was fully awake and panicking, I apologized profusely and begged for time to get there. Unfortunately, they couldn’t wait, so we had to reschedule. I continued to apologize, even by email afterwards. I was so mad at myself. If someone would have done that to me, I’d be snapping my fingers and moving my head from side to side making nasty judgmental comments. There’s one blessing, though. The guy who handed over the wrong envelope at the Oscars has a lot more to apologize for compared to my relatively mild gaffe. And if you need a nap to recover, buddy, my sofa is pretty comfortable. Call me.